I am a stained glass artist and welcome commissions for windows, doors and mirrors etc. Mosaics is also a passion of mine and of course helps in using up my left over glass! I have a small garden studio where I run workshops for groups of 3 or 4 people and love to see their creativity develop! 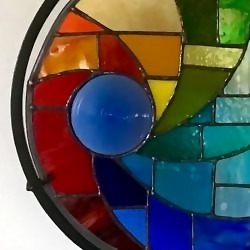 All things glass - stained glass, mosaics and fused glass.